When you find yourself in need of bail most people don't know where to turn. 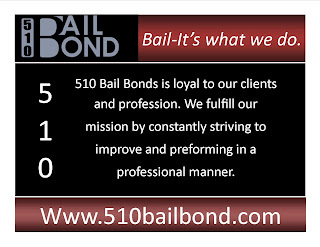 Check out this web site 510 Bail Bond it has listings of different jails around the Bay Area. If you are looking for an inmate in jail in the Bay Area try this site for inmate searches. Need bail in Sacramento? Look up Sacramento Bail Bonds - 510 Bail Bond has agents working in Sacramento to service all your bail bond needs. Need a bail bond in Oakland? Check out our Oakland division on the web at Oakland Bail Bonds. 510 Bail Bond websites are full of information that you will want to know. Should you talk to the police? See what we have to say about this and ten reasons why it's in your best interest not to talk to the police. More tips on bail later, if you need bail now give us a call at 510-760-9409.